According to the research of the Pet Food Manufacturers Association, around 16% of pet owners have a fish. And it is not a surprise as there are quite a lot of advantages of owning a fish tank. For example, fish are less expensive and easier to feed. Moreover, they are quiet and don’t need to be walked. So, it is a good idea for those people who are busy with work or just don’t have much free time. But one man decided that there is no need to buy a fish tank as it is possible to get a pet under the water. 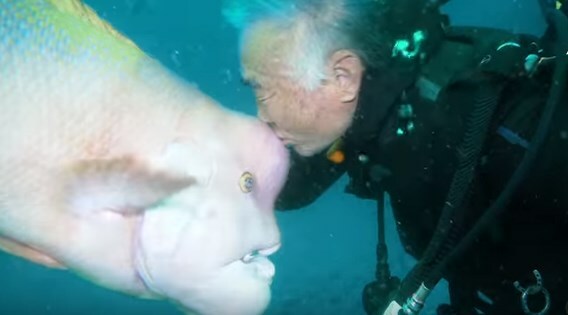 The Japanese diver took the meaning of friendship with animals to a whole new level! Hiroyuki Arakawa visits one fish for more than 25 years already. Over the years, Arakawa has been exploring the sea in hopes of finding a torii, one of the Shinto religion’s shrines. 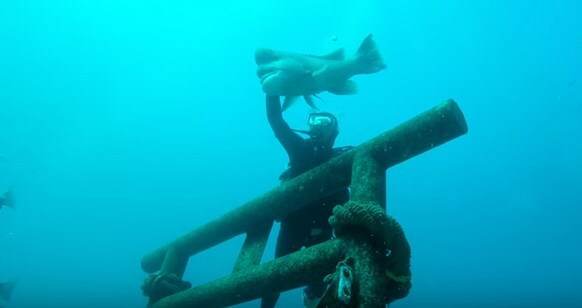 Instead, one day, he met Yoriko, an Asian sheepshead wrasse. The two became friends. One day, a bad situation happened. Hiroyuki Arakawa discovered that his best friend is in trouble due to an injury. But the man decided to take certain actions and take care of a fish. Every day, he fed his friend with crabs, and soon, Yoriko started feeling better. It was such a happy moment, and it was a proof that friendship between people and animals really exists. They still continue to see each other every day, and it seems that they are having really good time together.